Where it shines considerably is as an alternative to keyboard shortcuts and the system emoji picker. Tapping a button on the Touch Bar is far more accessible than trying to contort my hands to execute a keyboard shortcut or straining my eyes searching for an emoji. The Touch Bar, despite its name, is actually an Eye Bar: It forces your eyes off the screen, down to the Touch Bar, back up to the screen, repeat ad infinitum. There’s nothing physical about interacting with the Touch Bar, aside from using your finger: There are no defined button areas, and there’s no haptic feedback when you tap something. So you absolutely must look at the Touch Bar to interact with it. When the new MacBooks were released, I spent about 30 minutes testing a Touch Bar-equipped version in an Apple Store, and this constant moving of my eyes’ focus from keyboard to screen to keyboard to screen to…well, you get the idea…was incredibly disruptive. To use the Touch Bar, I’d have to change my focus to the keyboard, then refocus on the screen, taking time to find my active window and locate the mouse cursor. This did not make for a pleasant user experience. 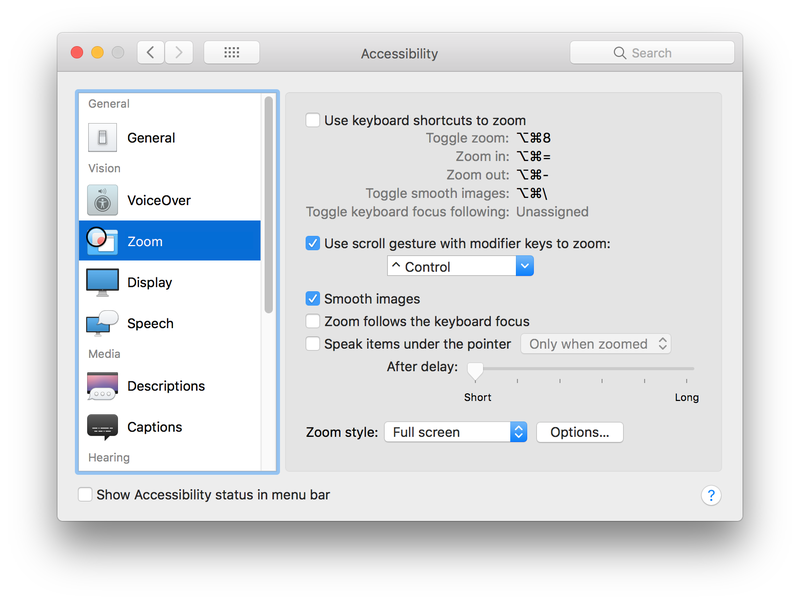 In addition, the Zoom feature—one of the Touch Bar’s many accessibility features—makes seeing controls much easier. You can really customize zoom in that panel, including making it usable via the keyboard, setting zoom limits, and more. I keep it simple, though, with a mouse-assisted full screen zoom. To zoom my screen, I hold down the Control key, then scroll my Magic Mouse with one finger, and I get infinite and easily-controllable zoom, all without ever taking my eyes off the screen. To zoom with the Touch Bar, I’d need to look at the Touch Bar while I tapped on it to get into zoom mode, then look back to the screen as I zoomed. That seems much tougher, and again, my eyes have to go from screen to keyboard and back—and do so again when I’m done zooming to exit zoom. Using a Mac should be about doing things efficiently, and to me, the Touch Bar is an incredibly inefficient solution to a non-existent problem. I’m with Marco, and hope that future laptops either remove the Touch Bar completely or make it optional. Question: did you take your eye off the menu to use the function keys on the keyboard? I did. I don’t—I use all the function keys by touch/memory. Even if I have to glance down, though, it’s just that—a glance and a key press. To use the Touch Bar, you need to focus on it and interact with it. Interesting. I think, frankly, that you’re a massive outlier in this regard. I suspect that 99% of people don’t have the function keys well enough mapped in their memory to be able to do it by touch. Given that, the touch bar works much the same as they’re already doing it. Personally, I take my eyes off to use all function keys except the escape key! That is probably the thing I am most worried about. There is the option to remap caps lock to escape which is probably what I’ll do (right now, I have it do nothing), but I then have to make that change on other platforms as well. Honestly, if they just kept the escape key but made the rest a touch bar, that would be perfect. Of course, Steve’s point was that multiple key combinations are not feasible for those with fine motor control issues. For everyone else, I agree with your premise. However. I find the touch bar often presents controls that are fairly rare, and for which I would not have key combinations defined. In this case, they are useful, and I would likely need to look to input a contorted three or four finger key combo. No feedback is a problem, and one it seems Apple can solve. I would submit that the main problem with the Touch Bar is that too many apps (including Apple’s own) don’t make very interesting use of it. Calendar and Reminders actually use the Touch Bar to make some tasks (such as assigning a time to a Reminder) easier to do. That’s good. But Safari and Mail, for instance, don’t present anything that saves the user time or effort. Tiny little thumbnails of tabs in Safari aren’t that useful. It’s still not the same, I don’t think. Glancing down to find F2 for brightness up is a lot different than tapping into the Touch Bar, opening the Brightness feature, then moving the slider. Even with a glance, F2 is going to be much faster every time. But you don’t need to have the slider for brightness — you can set it up with buttons, just like F2. My biggest problem with any touch-based device is that for some reason, my finger taps do not always register. This leads to me having to do multiple taps to get a response, and sometimes I end up with several taps getting detected and doing something unexpected. Must be something about my skin, but buttons are definitely better for me. So are you going to trade in your touch bar Mac for a function key one? Not sure if you’re replying to me or someone else, but I don’t own a Touch Bar equipped Mac, and won’t until/unless it’s all they sell and my machines are getting too old to keep using.